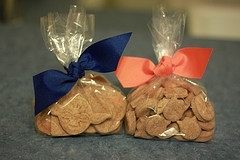 This recipe for homemade dog biscuits is easy to make, good for them and the pups love them. I also offer homemade cat treats, horse treats and food for our feathered friends. These homemade dog treats recipes are easy to make. If you want shapes, go to a hobby store and purchase a bone or tuna cut out, or just cut them in the pan. Following are free dog treat recipes that are "Rocky Approved." My treat recipes make healthy and wholesome snacks for your favorite dog. They're economical and easy to prepare. Puree all ingredients in a food processor or blender. Grease and flour two 9 inch square baking pans. Slice into small treat-sized portions and store in small Ziploc bags in the refrigerator and freezer (some for now, some for later). These recipes make wonderful Christmas gifts for dogs and cats. Just buy a cheap dog bowl - fill with baked treats and then wrap. 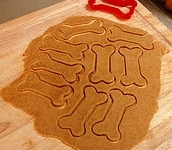 Following is wonderful dog biscuit recipe. Combine all ingredients in a bowl and stir until mixed thoroughly. Knead dough for one minute and roll out dough to 1/4 inches onto a floured surface.